As you’ll see below, the memes really do have about the same amount of factual content as The Onion. This is what I like to call “chicken and egg” economics. What came first, the record profits or the well paid workers? It isn’t much of a hard riddle to solve – how do you pay workers well unless you’re first profitable? The business model of Walmart and Sam’s Club focusses on serving low income individuals, while Costco is located in wealthier areas. Finance blog “The Motley Fool” refers to Costco as the “Walmart of the Wealthy.” And it should come to no surprise that Costco brings in more revenue per employee than Walmart does when their business model is catering to the upper class. Costco brings in $620,000 per employee, compared to $211,000 for Walmart. Does anyone really think that Walmart’s cashiers would develop the ability to bring in an additional $400k for the business every year had only they been paid more? There is evidence that well paid workers do perform better, but not to such an inflated extent. John Derbyshire was certainly onto something when he said, “wherever there is a jackboot stomping on a human face there will be a well-heeled Western liberal to explain that the face does, after all, enjoy free health care and 100 percent literacy. Even I was surprised by the support of Fidel Castro, but US Uncut has posted in support of Ahmadinejad as well so maybe this isn’t such a stretch. America actually does spend more on education than on the military. Liberals will often try to prove otherwise by isolating the Federal budget. And indeed when you look at the federal budget, we see a miniscule $71.9 billion spent on education, compared to $672.9 for the military (in 2012). This neglects that basic fact however that most education spending is done on the state and local level. When you look at the cost of government at all levels – federal, state, and local – 15.2% of money goes towards education, compared to 13.8% on defense. Now, we surely don’t spend five times as much on education than the military as Cuba does, but Cuba isn’t the world’s biggest military spender – America is. For our education spending to be five times the size of military spending, we would have to devote over 20% of GDP towards education. Anyone who thinks this is a good idea should familiarize themselves with the concept of diminishing returns. So how does Cuba’s spending compare? To Cuba’s credit, they do spend an enormous chunk of their budget towards education – 10%. But as we’ve seen, 15.2% of all government spending in the U.S. goes towards education. Education spending per pupil in the U.S. is $11,184 (2009-10), which is higher than the average Cuban’s yearly income. The student to teacher ratio in Cuba is a small 9:1, compared to roughly 16:1 in the U.S.. Flaws of the U.S. education system stem from much more than its student teacher ratio however. Test scores have remained virtually unchanged since the 1970s (when the student teacher ratio was 22.3:1), even while real education spending per student has tripled. The cost of installing solar technology is more than double in the U.S. than in Germany, due entirely to red tape that exists in the U.S. but not Germany. The lack of red tape is something that Germany does right. If the U.S. wants to encourage people to use solar energy, deregulating the market would be a much more efficient start than subsidizing it would be. Over one hundred billion Euros have been spent on solar subsidies thus far. Eight billion euros were spent on subsidies in 2011 – and that year solar energy only generated 3% of Germany’s entire energy supply – and between 3-10% of their electricity, not 50%. I can only speculate as to where the 50% figure comes from. One environmentalist website reported on a particular Saturday where half of Germany’s mid-day energy was generated from solar energy, but that was just a single day. An article I found on Reuters that also cited the 50% figure reported the same. How someone was able to make the leap from solar energy providing half of Germany’s electricity during the afternoon (not the entire day) on a single Saturday to solar energy providing half the entire county’s electricity is beyond me. If only it were so easy to fix our education system! 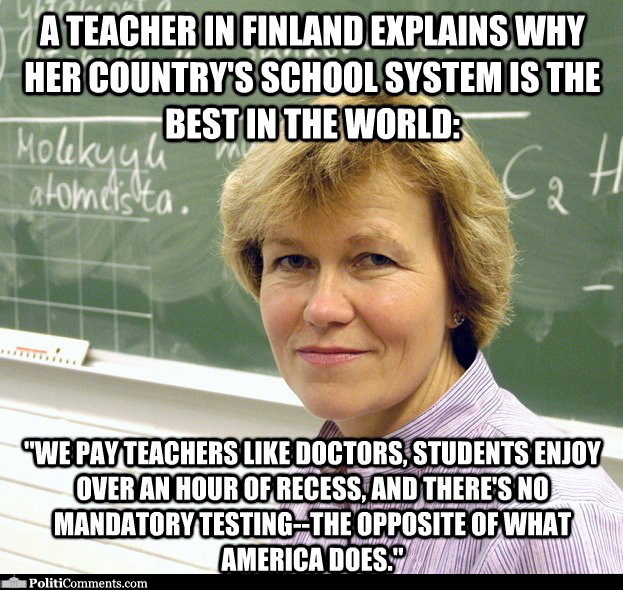 We can know for sure that this isn’t the solution – because American teachers earn more than Finnish teachers. A teacher in Finland with 15 years experience earns $37,500 a year, compared to $45,225 for an American teacher with the same level of experience. And that doesn’t even take into account that the cost of living is 30% higher in Finland. Doctors in Finland only earn $70,000 a year, so perhaps “In Finland we pay doctors like teachers” is a more appropriate claim. The only true part of the meme is regarding mandatory testing and recess. There is no mandatory testing in Finish schools, with the exception of a National Matriculation Examination taken at the end of high school. How additional time to play kickball plays a role in the success of Finish education remains a mystery however. Switzerland currently has no minimum wage and no limits on CEO pay and bonuses. Swiss voters rejected a proposal to limit executive pay last November. There was a proposal that was voted on May 18th 2014 which would have installed a minimum wage of $24.73 an hour, but it was voted down. It’s questionable about how a minimum wage that doesn’t exist is responsible for its alleged status as having the lowest income inequality of the world (a position that Denmark, not Switzerland can boast of). The myth that Iceland didn’t bail out its banks during the most recent financial crisis is one that spans the entire political spectrum. I first “learned” the myth as fact from the conservative National Affairs journal. And as someone opposed to the bailout of industry on principle, it was a myth that I wanted to believe. When researching for my book, I had planned on juxtaposing the U.S. response to the financial crisis whereas nearly $1 trillion was spent on bailouts in contrast to Iceland, which functioned without a bailout. There was only one problem: Iceland bailed out its banks. In November of 2008, Iceland received a $4.6 billion bailout from the International Monetary Fund. Iceland’s GDP in 2008 amounted to $16.83 billion, which means that this bailout amounted to 27.3% of GDP. Had the U.S. bailed out banks to the tune of 27.3% of GDP in 2008, the bailout would’ve been over $3.88 trillion, which is more than just a tad more expensive than what the bailout actually cost ($700 billion). So not only did Iceland bail out its banks – it did so at a cost over five and a half times times higher than the U.S. did. In 2012, Norway’s national debt stood at 28.8% of GDP. This is lower than what the U.S. owes as a percentage of the economy, but it’s not exactly “no national debt.” Norway places a 28% tax on profits, and a 50% tax on offshore oil and gas production, which is there the 78% figure comes from. Taxing corporations is much more appealing to people than taxing individuals, but this doesn’t mean that individuals aren’t paying for corporate taxes. Economist Walter Williams did a great job of illustrating this point when he asks “Virginia has a car tax. Does the car pay the tax? In most political jurisdictions, there’s a property tax. Does property pay the tax?” Point being: all taxes are ultimately paid for by people. If a corporation’s tax rate goes up, they can simply pass the cost onto their consumers by raising their prices to counteract losses from the tax. Norway is a prime example of this. Despite being oil rich, the price of gas in Norway tops $10 a gallon. Even if Norway did have no national debt, we can’t exactly pinpoint this particular tax as the reason why. In 2010, Norway’s government received 1,056.5 billion krone in revenue, 181.4 billion of which came from taxes on petroleum. Income taxes on individuals, and VAT taxes were both larger sources of revenue. Next Are 97% of the Poorest Counties Really Republican?